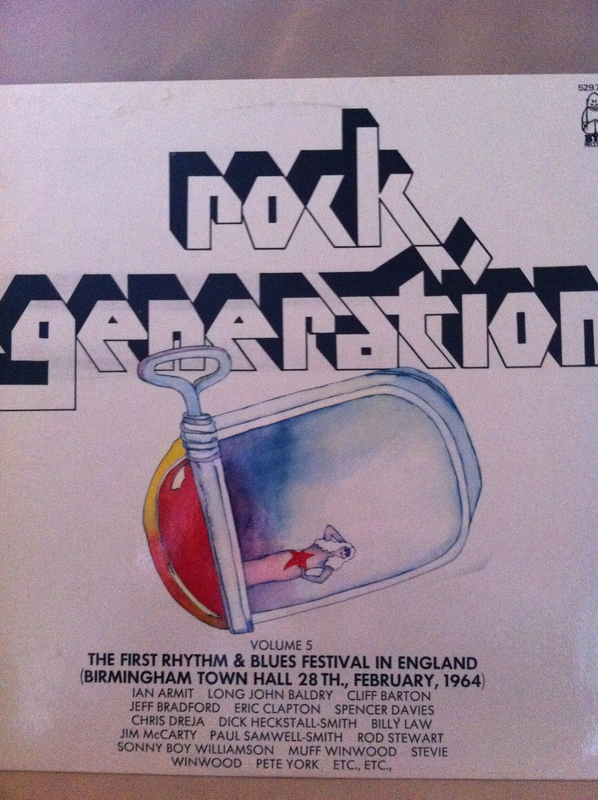 I was shown this album by Alan Cross, Andy Hamilton’s manager, who has a pretty impressive record collection. 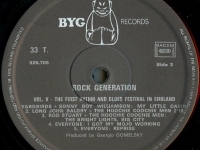 According to the title, the first ever Rhythm and Blues festival was held at the Town Hall on 28 February 1964. 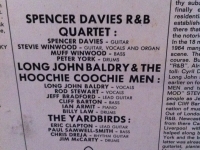 Recorded live, the album features greats such as Sonny Boy Williamson, Spencer Davis R & B Quartet, The Yardbirds and Long John Baldry and the Hoochie Coochie Men who included a young Rod Stewart on vocals. 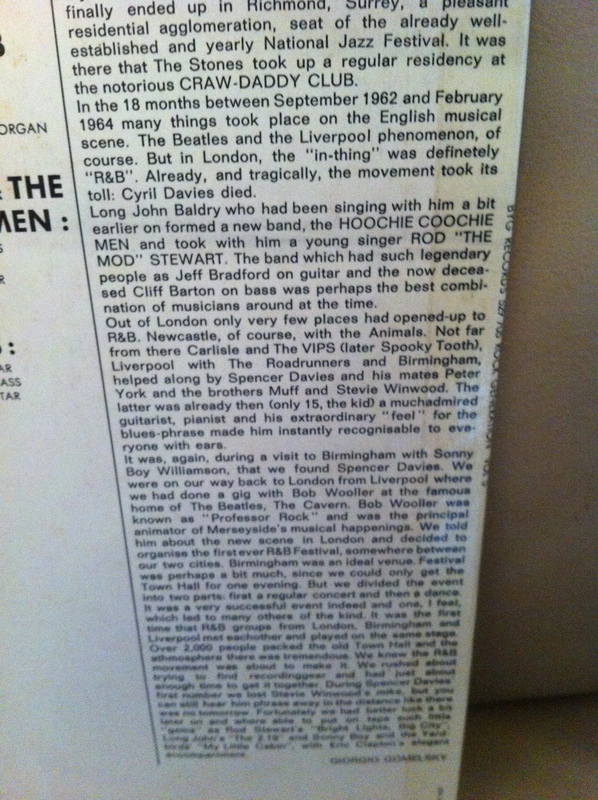 The cover clearly states Rod Stewart but as you can see on the label there is a credit for Rod Stuart. Anyone who went could clear this up? 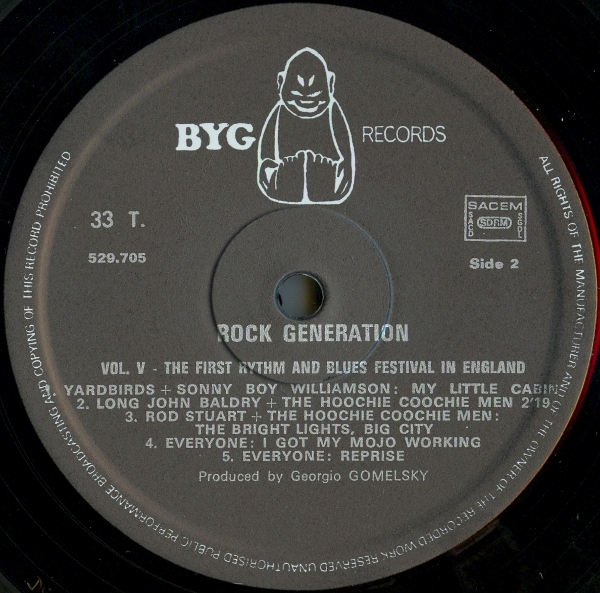 What is also interesting is the album was part of a series called the Rock Generation (this is volume 5) yet this is a Rhythm and Blues Festival. 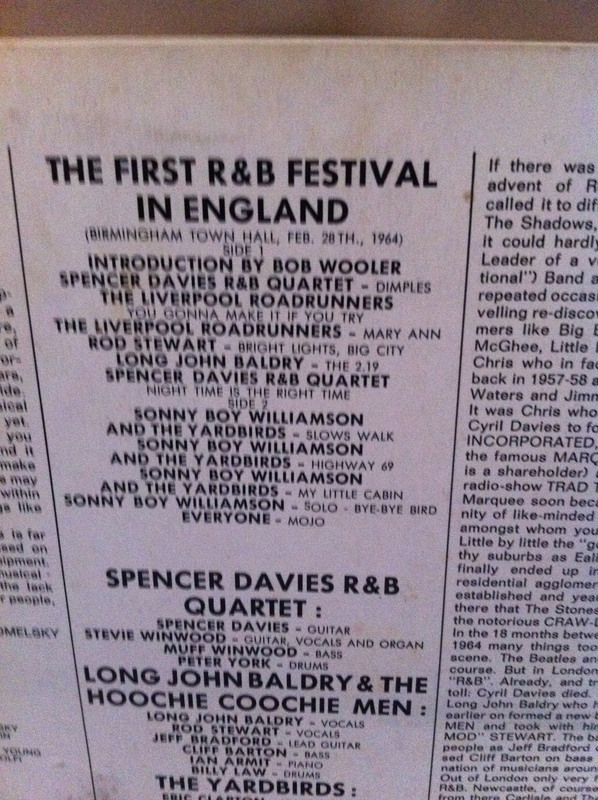 Released on BYG Records, this is a great slice of Birmingham, Town Hall and British R&B history. As always, would love to hear from anyone there, or did you know the Announcer caught on record, Bob Wooler? 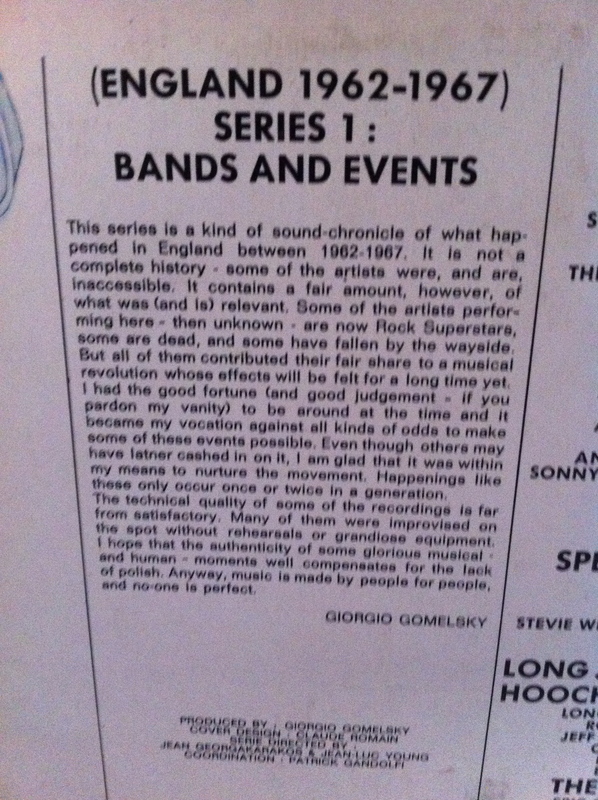 As Giorgio admits in his sleeve notes, hardly a festival, just one evening in the Town Hall. 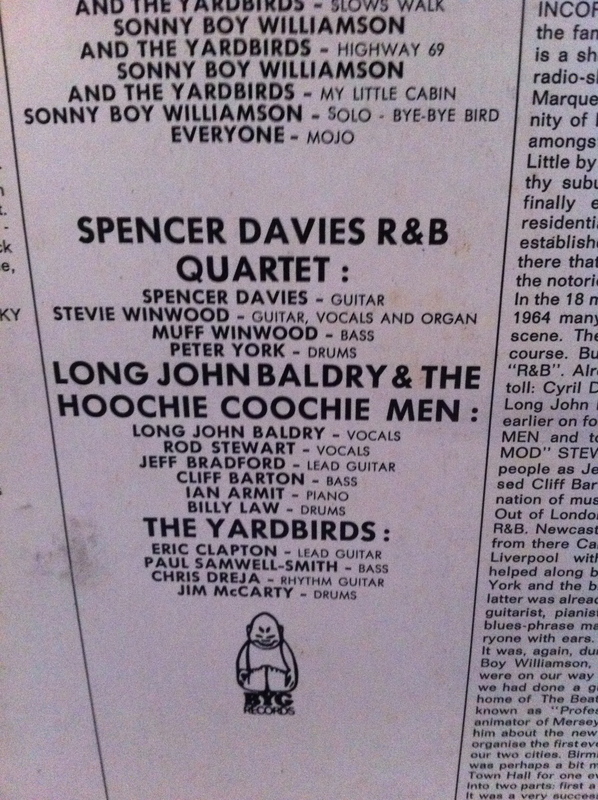 The Hoochie Coochie Men did indeed include Rod Stewart on vocals. 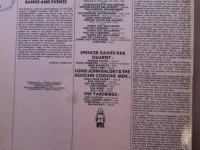 The cover is correct, the record’s label (Rod Stuart) is wrong – it also spells rhythm wrong in the title and Spencer Davis wrong. 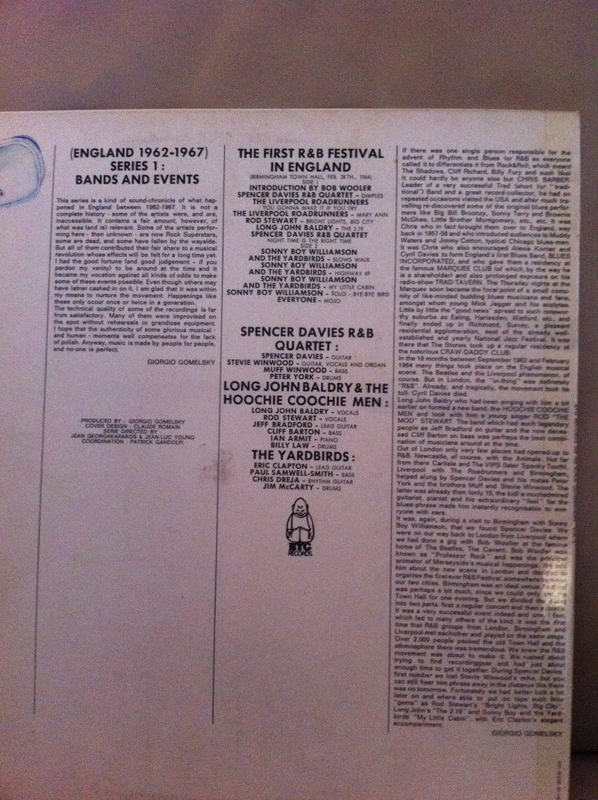 This version looks like the sleeve is from one country whilst the record (with a different running order and a Spencer Davis track missing) is from a different country or a later pressing. 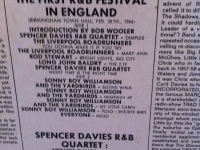 Bob Wooler died over ten years ago. 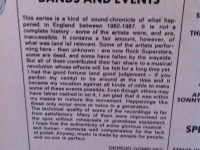 Oh and about your, “interesting is the album was part of a series called the Rock Generation (this is volume 5) yet this is a Rhythm and Blues”, the whole series was largely R&B acts associated with Giorgio in the 60s: The Animals, The Yardbirds, Graham Bond Organisation, Steampacket, Gary Farr & The T-Bones, Brian Auger and Julie Driscoll. 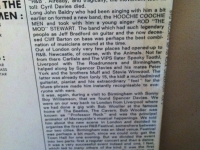 yes i was a kid there – but what was the name of the pokey little club in [deritend?] 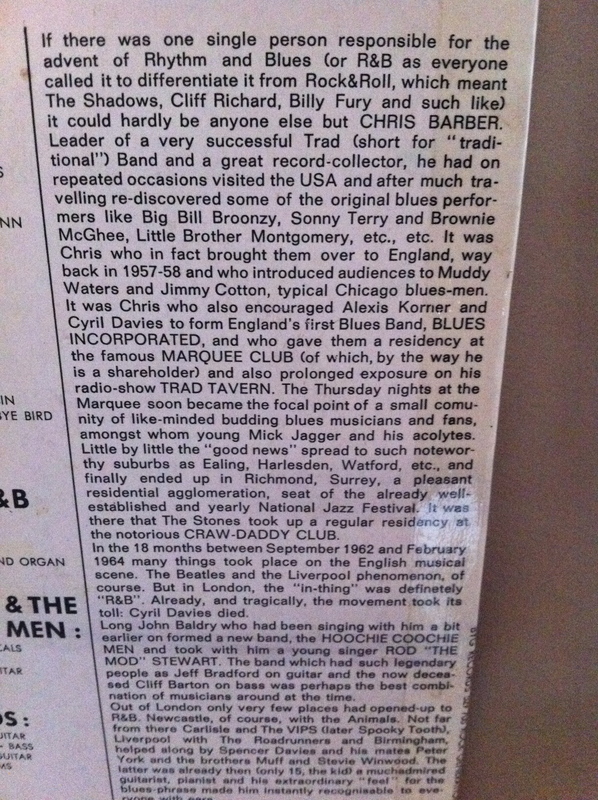 that he played at and was me old mate jim toomey on drums with the hoochie coochie men – anybody out there still alive that knows? 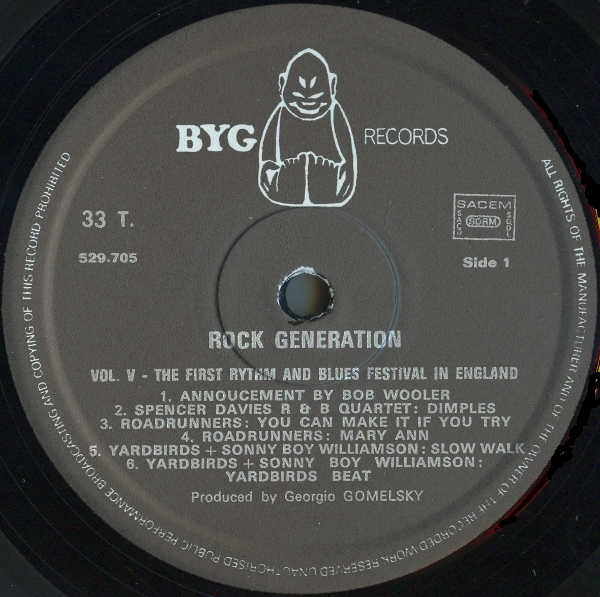 I picked this album up by a stroke of luck about 40 years ago; I think BYG were a French label, which may explain the dodgy spellings. 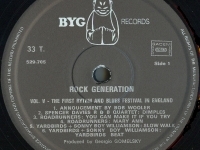 Also featured are the Roadrunners, a Liverpool band much esteemed by George Harrison whose frontman Mike Hart died recently (see Guardian obituary, 19/7/16). Rod Stewart is in fine voice, and almost breaks the mic on Bright Lights Big City! There’s also a blistering version of Night Time Is The Right Time which I think is sung by Ottilie Patterson (who is mentioned by Bob Wooler in his intro but isn’t credited on the sleeve). 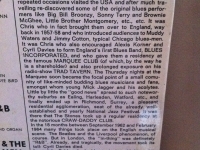 Wooler was a noted Cavern Club DJ and mainman of Mersey Beat magazine. 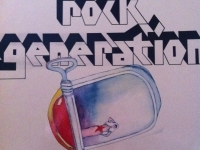 Good album, well worth picking up if you see it though goodness knows what a dealer would charge for it now.